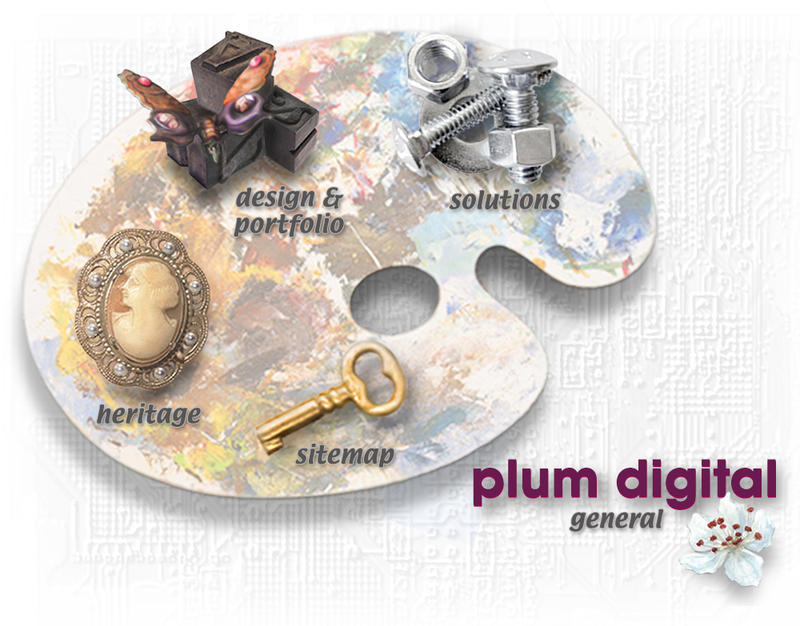 Plum Digital: Sandra Ragan, DBA Plum Grafik Visual Communication. Choose an area from the palette, the links below or the Site Map. Like the Hindu Fable, "The Blind Men and the Elephant,"
because we are ALL the sum of many parts. Basic details about the changes are here. Portfolio and Resume for Sandra Ragan. Training information. Web FAQS, Infomational Data sheets and Client materials. Heritage Menu > Genealogy Resources: General, Regional, US States, Family Tree. Features Family History and Surnames. Family Web Cards. Site Map > Direct links to all major pages. Warren Littell Design, Architectural Portfolio. Updated 2018. The new Kessler Piano Service site went live on Web.com in time for New Years 2018. The final Kessler Piano proposal (Dreamweaver) will come down soon. For information on the creation of this site see About This Site. For information about the recent renovation, go here. The cameo belonged to my grandmother. The plum blossom is a watercolor drawing. The type and butterfly is a photo construction from an 80's sweater pin and a single metal type block belonging to a friend. Two of the characters are total digital creations. For us "geeks," the embossed pattern is an Apple Mac II motherboard.